The rail business is an industry full of tired, stressed workers. It is an epidemic. I know this first-hand because, before coming to the NTSB several years ago, I spent more than 30 years working in the freight railroad industry. While freight railroad managers and crews count on reliable schedules to make their shipments and make their customers happy, there is no routine schedule for the hundreds of thousands of crewmembers employed in this business. As a result, many railroad workers are literally walking and working in their sleep. One of my last jobs before coming to the NTSB was as a trainmaster for a major freight railroad. My duties included safely seeing the arrival and departure of trains in and out of terminals in California. I spent a large majority of my time reviewing train schedules and communicating with train personnel of arriving and departing trains. I coordinated the efforts of nearly 300 crewmembers, including yardmasters, dispatchers and engineers, to execute the transportation plan on my territory. Additionally, I was responsible for making sure all the work was done safely and in accordance with rules and regulations. The job was very stressful and required long hours. It wasn’t unusual for me to work 80 hours a week. I often worked overnight, evenings, weekends and long hours. Over time, I became chronically fatigued. I gained weight and began to lose my memory and other cognitive abilities. I had no routine schedule for sleep, because I worked irregular hours that were counter to my circadian rhythms. Eventually, I began to make mistakes at work and in my personal life – potentially dangerous ones. Noting how my work and home life was suffering, I went to a sleep specialist. The doctor determined that I was fatigued at a dangerous level – to the point where the state of California took my driver’s license. Ironically, while I could no longer drive a car, I was still expected to carry out the meticulous details associated with managing rail yards. I warned my bosses, but there was little help or response. I made suggestions for improvements, including encouraging the railroad to provide better lineups and opportunities for rest, but I felt unsupported and became concerned for the safety of my crews. Eventually, I left the railroad and began a new career. My story is not unusual. And when I came to the NTSB as Chief of the Railroad Division, I quickly learned that the NTSB also realized the dangers of fatigue in the railroad business. As a result of our investigations in recent years, we have issued more than 25 recommendations related to managing fatigue—all still open, needing to be addressed. Wreckage of BNSF train, including lead locomotive of striking train, at Red Oak, Iowa. One accident, in particular, involving a freight train perhaps best highlights the danger the NTSB is attempting to eradicate. In April 2011, an eastbound BNSF Railway (BNSF) coal train traveling about 23 mph, collided with the rear end of a standing BNSF maintenance-of-way equipment train near Red Oak, Iowa. The collision resulted in the derailment of 2 locomotives and 12 cars. The lead locomotive’s modular crew cab was detached, partially crushed, and involved in a subsequent diesel fuel fire. Both crewmembers on the striking train were fatally injured. We determined that the probable cause of the accident was the failure of the crew of the striking train to comply with the signal indication requiring them to operate in accordance with restricted speed requirements and stop short of the standing train because they had fallen asleep due to fatigue resulting from their irregular work schedules and their medical conditions. As a result of that accident, we recommended that the railway require all employees and managers who perform or supervise safety-critical tasks to complete fatigue training on an annual basis and document when they have received this training, and that they medically screen employees in safety-sensitive positions for sleep apnea and other sleep disorders. Both the conductor and the engineer had worked irregular schedules for several weeks leading up to the accident. During this time, work start times often varied significantly from day to day for both crewmembers. Changing work start and end times can make achieving adequate sleep more difficult, because irregular work schedules tend to disrupt a person’s normal circadian rhythms and sleep patterns, which in turn can lead to chronic fatigue. 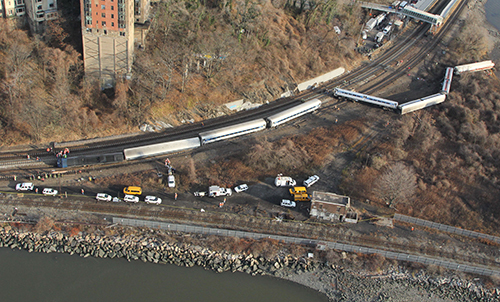 Scene of the derailment of Metro North Train 8808. More recently, we investigated an accident in New York where a Metro North Railroad locomotive engineer was operating a train with undiagnosed severe obstructive sleep apnea (OSA). The train, on its way toward Grand Central Station in New York, New York, had 115 passengers on board. The engineer headed into a curve with a 30 mph speed limit traveling at 82 mph, resulting in a derailment. Sixty-one people were injured, and 4 passengers died. The engineer experienced a dramatic work schedule change less than 2 weeks before the accident, with his wake/sleep cycle shifting about 12 hours. Previously, he had complained of fatigue but had not been tested or treated for sleep apnea. After the accident he had a sleep evaluation that identified excessive daytime sleepiness and underwent a sleep study resulting in a diagnosis of severe OSA. Following the study, he was treated successfully for OSA within 30 days of the diagnosis. The NTSB issued safety recommendation to the Metro-North Railroad to revise its medical protocols for employees in safety-sensitive positions to include specific protocols on sleep disorders, including OSA. We have issued numerous recommendations to the Federal Railroad Administration, as well, requiring it to develop medical certification regulations for employees in safety-sensitive positions that include, at a minimum, a complete medical history that includes specific screening for sleep apnea and other sleep disorders, a review of current medications, and a thorough physical exam. If such a recommendation had been implemented at the railroad for which I worked, my fatigue most likely would have been caught earlier and mistakes avoided. And while the railroads and the federal regulators are responsible for addressing this epidemic, so too must railroad workers recognize the dangers of working while fatigued. Yet many are compelled to make money and want to stay ready to react at any hour of the day to avoid missing the opportunity to get paid. To a certain extent, I understand this. And that’s why we must also work with labor unions to address this issue and provide workers the opportunity for sleep, while still allowing them the opportunity to get a paycheck and progress in their careers. 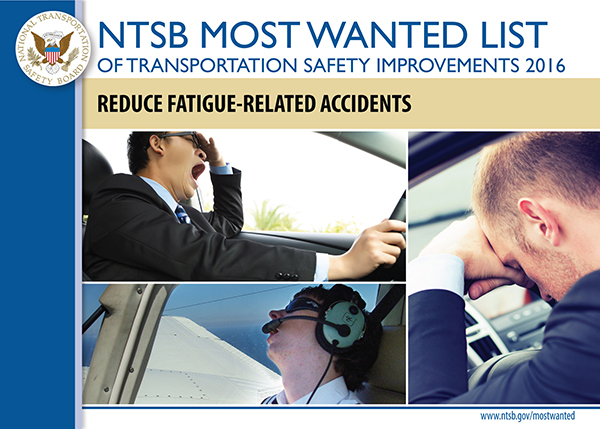 Fatigue in transportation is such a significant concern for the NTSB that it has put “Reduce Fatigue-Related Accidents” on its Most Wanted List of transportation safety improvements. It is not just an issue in rail, but an issue in all modes of transportation that must be addressed. As a former railroad worker and now as a supervisor of railroad accident investigators, I can tell you we still have a long way to go to address this issue. Doing so will require the joint efforts of the regulator, the operator, and the employee. These efforts must be undertaken, because we can’t keep running down this dangerous track. Georgetta Gregory is chief of NTSB’s Railroad Division. The NTSB is known for investigating large-scale air carrier accidents and other major transportation events. But a significant part of the agency’s daily workload is investigating general aviation and charter aircraft accidents across the country. There were 1,256 accidents involving general aviation and charter aircraft in 2014. Of these, 261 accidents resulted in the deaths of 439 people. Charged with investigating them are 52 aviation safety investigators, or ASIs, based around the country, who often travel solo to a crash scene. While they may be the only NTSB investigators on scene, they are supported by the agency’s resources in Washington—ranging from our state-of-the-art laboratory to specialists in metallurgy and air traffic control. A new television series on the Smithsonian Channel looks at the challenges and rewards of the NTSB’s ASIs in Alaska, who are charged with investigating airplane accidents in a state where weather and terrain make air travel a necessity. The TV series, Alaska Aircrash Investigations, which debuted yesterday, follows our Alaska ASIs during the on-scene investigation of small airplane, or general aviation, crashes. The series provides a rare, behind-the-scenes look at the incredible work these men and women do. The purpose of sending ASIs into the mountains and crevasses of Alaska to investigate crashes is to try and find out why the accidents happen and what can be done to prevent them from happening again. The show informs the public about the processes NTSB investigators undertake to find the probable cause of accidents. The series also highlights important messages about general aviation safety. The series also sets into sharp focus some of the safety challenges throughout the general aviation community that the NTSB has been concerned about for years and that have been a mainstay on the NTSB’s yearly Most Wanted List of transportation safety improvements. In the 2016 Most Wanted List, we focus on loss of aircraft control by the pilot. Between 2008 and 2014, about 47 percent of fatal fixed-wing general aviation accidents in the United States involved pilots losing control of their airplane in flight, resulting in 1,210 fatalities throughout the United States. During the past 12 years, air fatalities dropped by 57 percent in Alaska. Based on accident investigations in Alaska in the past decade, the NTSB identified 32 different actions needed to improve aviation safety. Aviation in Alaska is central to sustaining communities, economies and the enjoyment of the wilderness of our nation’s last frontier. Two notable examples of safety improvements in Alaskan aviation include the use of weather cameras throughout Alaska and the FAA’s Capstone Project. The use of weather cameras in Alaska provides pilots real-time intelligence on flying conditions, allowing them to “see” the weather conditions they will encounter on their journey. The FAA’s Capstone Project is a GPS-driven system that gives pilots improved situational awareness by allowing them to see where their aircraft is in relation to terrain, and it allows small operators and dispatchers to provide real-time flight-following capabilities. The Alaska Air Carriers Association, the Aircraft Owners and Pilots Association and the Medallion Foundation have all worked with the Federal Aviation Administration and the NTSB to advance safety in the general aviation community. The work of the men and women of the National Transportation Safety Board is vital to the continuous improvement of safety across all modes of transportation. While the general public has access to all of the findings and results from NTSB accident investigations on its public docket, much of that day-to-day investigative work is conducted out of the public eye. Alaska Aircrash Investigations provides the public we serve a glimpse into the NTSB’s investigative process and the challenges our investigators face in our nation’s last frontier. Chris O’Neil is the NTSB’s Director of Public Affairs. If you have spent any time on social media, you’ve probably seen pictures and stories hash-tagged #TBT – for Throwback Thursday. Every Thursday in various social media channels (Facebook, Twitter, Instagram), people post photos and messages about memories from the past (good or bad), and people comment on those posts and offer memories of their own. Taking a page from that popular trend, the NTSB introduces #MWLMonday. While we are known for our thorough investigative reports, you may not be aware of our many safety advocacy efforts. These efforts are directed primarily at raising awareness about the 10 safety issues identified on our Most Wanted List (MWL) of transportation safety improvements. Our MWL highlights safety issues that still need action, derived from our real-world accident investigations. Each Monday, we will highlight one of these 10 safety issues; thus, #MWLMonday. On #MWLMonday, we will offer brief, shareable items for social media– we’ll also give you links to learn more. We’ll share the stories of NTSB investigations, and the stories of everyday people—all with a focus on a safety concern identified on our MWL. Another goal of our #MWLMonday postings is to encourage dialogue and discussion. What we’d really like to see is people adding their own stories, comments, and pictures to the conversation. We want people to share those tweets and posts with their friends on social media. Going viral can help fight America’s epidemic of transportation deaths and injuries. Help us start with #MWLMondays! For questions about our social media efforts or to suggest a blog topic or Twitter conversation, mail to: SafetyAdvocacy@ntsb.gov. Stephanie Shaw is a Safety Advocate in the NTSB Office of Safety Recommendations and Communications. 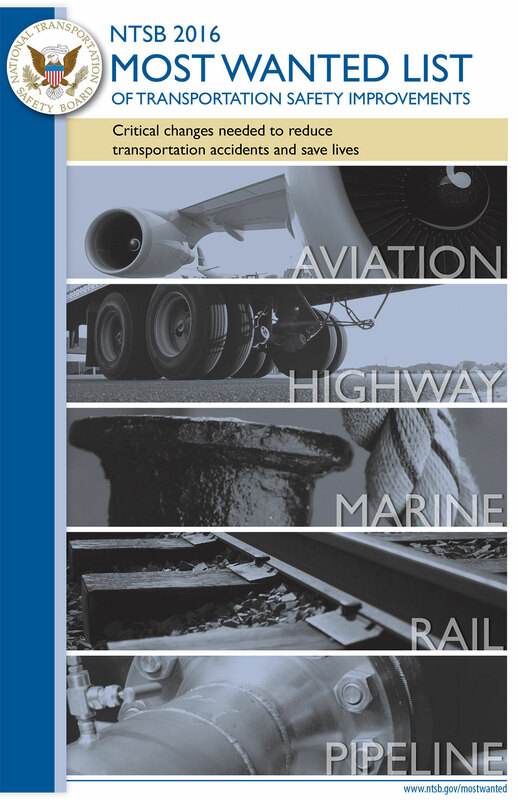 On February 29, 2016, the scientific journal Injury Prevention published “Fatigue in Transportation: NTSB Investigations and Safety Recommendations,” which I co-authored with former NTSB Board Member (and fatigue expert) Dr. Mark Rosekind. We reviewed all recent major NTSB investigations in all modes of transportation for the presence of fatigue in accidents. Bottom line: fatigue was present in 20 percent of them as a probable cause, a contributing factor, or a finding. The presence of fatigue varied among the modes of transportation, ranging from 40 percent of highway investigations to 4 percent of marine investigations. And this is after 109 years of federal government action to mitigate the risk of fatigue in transportation. Congress passed the Hours of Service Act on March 4, 1907. Fatigue regulations have been continually reviewed and revised as we learn more about the impact of fatigue; as recently as January 12, 2012, the FAA published a final rule substantially revising and improving the fatigue regulations governing commercial aviation. However, the NTSB continues to see fatigue in transportation tragedies and incidents in investigations in all modes of transportation. Accordingly, we have issued safety recommendations to help prevent recurrences. Since the NTSB issued its first fatigue recommendation in 1972, we have issued 205 separate fatigue-specific recommendations. Dr. Rosekind and I divide these recommendations into seven subject categories. We list the number of recommendations in each category, both overall and by transportation mode. We also analyze the types of organizations that received the recommendations, whether the recommended actions have been taken, and the NTSB’s evaluation of whether the actions taken satisfied a given recommendation. Of the seven subject categories, scheduling policies and practices account for 40% of all fatigue recommendations. Other subject categories included Education/Raising Awareness; Organizational Strategies; Medical issues affecting sleep; Vehicle and Environmental Strategies and Technologies; Research and Evaluation; and Fatigue Management Plans. Overall, 54 percent of NTSB fatigue safety recommendations were issued to federal agencies, but this percentage varied among modes, with 86 percent of all aviation fatigue recommendations being issued to federal agencies, and only 30 percent of rail recommendations issued to these agencies. Other types of organizations receiving recommendations included transportation operators (both government and private companies), labor unions, and professional associations. In the more than 40 years since our first fatigue recommendation, the scientific knowledge related to fatigue, sleep, circadian rhythms and sleep disorders has grown enormously, and there has been a parallel increase in investigators’ recognition of fatigue as a causal or contributory factor. In addition, investigative techniques (such as collection of a 72-hour history) are now standard components of major investigations. These advancements in science, recognition, and investigative techniques have resulted in fatigue findings that previously might not have been identified. The more we know about fatigue, the more clearly we learn that proper sleep is foundational to all human functioning – including in the operation of vehicles in transportation. March 6-13, 2016, is National Sleep Awareness Week, which is a great time to think about improving our sleep habits for both our health and our safety. Sleepiness while driving can have serious consequences. A lack of sleep slows reaction time and makes us more susceptible to forgetting or overlooking important tasks. Drowsy drivers may also experience microsleeps—brief episodes of sleep that may only last a few seconds—without being conscious that they are occurring. A few seconds is all it takes to drift out of the lane or to miss a stopped vehicle ahead. The NTSB has investigated numerous crashes in which driver drowsiness played a role. 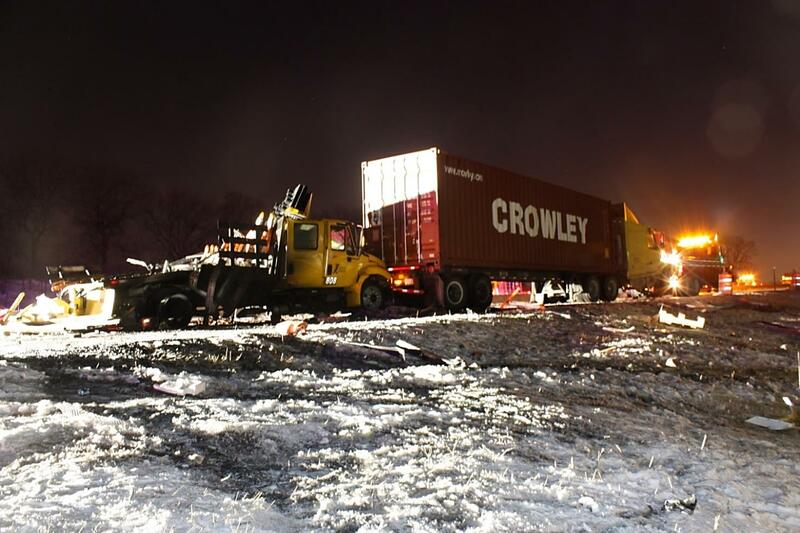 Last month, the NTSB met to discuss a January 27, 2014, crash involving a truck-tractor semitrailer that collided with stopped vehicles that were providing assistance to a broken-down truck-tractor semitrailer in the right lane of Interstate 88 near Naperville, Illinois. As a result of the collision, an Illinois State Toll Highway Authority worker died and an Illinois State Police trooper was seriously injured in a postcrash fire. The Board concluded that the driver of the striking truck was impaired by fatigue due to his lack of adequate sleep—estimated as less than 4.5 hours in the 37 hours prior to the crash—which resulted in his delayed response to the vehicles stopped ahead of him. On the day of the crash, and on several prior occasions, the driver had not complied with the federal rules governing hours of service and had falsified his logbook. In the Naperville crash, the driver knew how much rest was required, but did not adhere to the rules. A recent AAA Foundation study showed that many drivers who understood the risks of drowsy driving did so nonetheless. Specifically, the AAA survey found that 97 percent of drivers see drowsy driving as a serious threat and a completely unacceptable behavior. However, among that same group, nearly 1 in 3 admitted to driving when they were so tired that they had a hard time keeping their eyes open. Take rest breaks during longer drives. Avoid driving during early-morning hours, when the brain is wired to be asleep. Talk to your doctor if you have trouble sleeping or are sleepy during the day. Check medicine labels to understand how they may affect your driving. Never drive while you are drowsy; pull over to rest or change drivers at the first sign of drowsiness. The NTSB is concerned with the issue of fatigue in all modes of transportation and has included “Reduce Fatigue-Related Accidents” on its 2016 Most Wanted List of transportation safety improvements. Jana Price, PhD, is Chief of the Report Development Branch in NTSB’s Office of Highway Safety. I have a great appreciation for the training and skill it takes to fly a helicopter. Rotorcraft are vital to our transportation system; they have remarkable agility and go where no other transport vehicles can go. They often serve the common good and help our economy by providing medical care, fighting fires, assisting law enforcement, serving as “aerial cranes” in construction, transporting workers to inaccessible locations, and generally doing work that no other vehicles can do. Helicopters have personal significance for me, too. Before I was born, an American-trained Choctaw CH-34 pilot saved my parents and three older brothers by flying them to safety during the Tet Offensive in Vietnam. One of those brothers, now a surgeon, has been able to help traffic crash victims, thanks to the emergency medical helicopters that transport him to those who are injured far from his Level 1 trauma center. Vice Chairman (center, in blue) and Aviation Safety investigators and staff, from L-R, Ralph Hicks, Jeff Kennedy, Jim Silliman, Van McKenny, Chihoon Shin, and Clint Johnson. So, with that background, I was particularly excited to attend my first HAI Heli-Expo, the world’s largest helicopter conference and exposition. 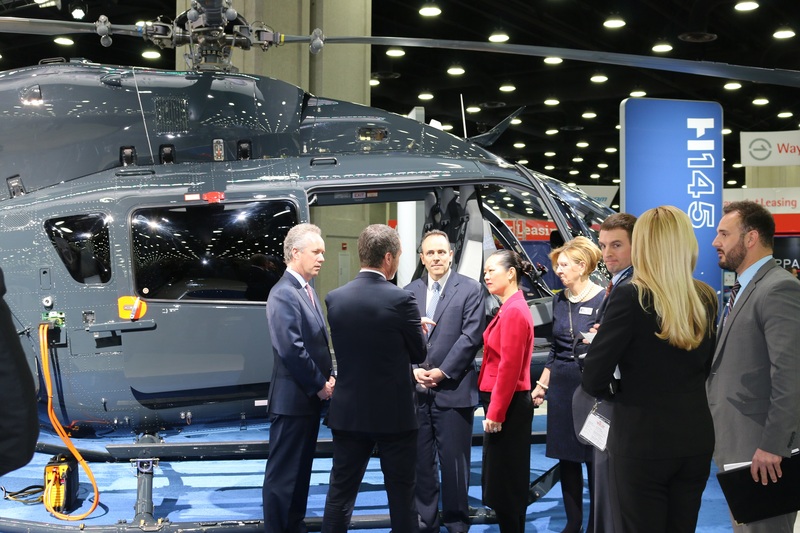 An annual event sponsored by the Helicopter Association International (HAI), this year’s event took place in Louisville, Kentucky, and was attended by nearly 20,000 owner-operators, pilots, mechanics, manufacturers, and helicopter vendors. A key focus of the event, as usual, was safety. I came to this Heli-Expo to learn. I wanted to know about the safety issues and concerns for the industry. I also came with a message from NTSB to the helicopter community: Thank you for your strong efforts to improve rotorcraft safety, and let’s continue to work together to address important safety issues. 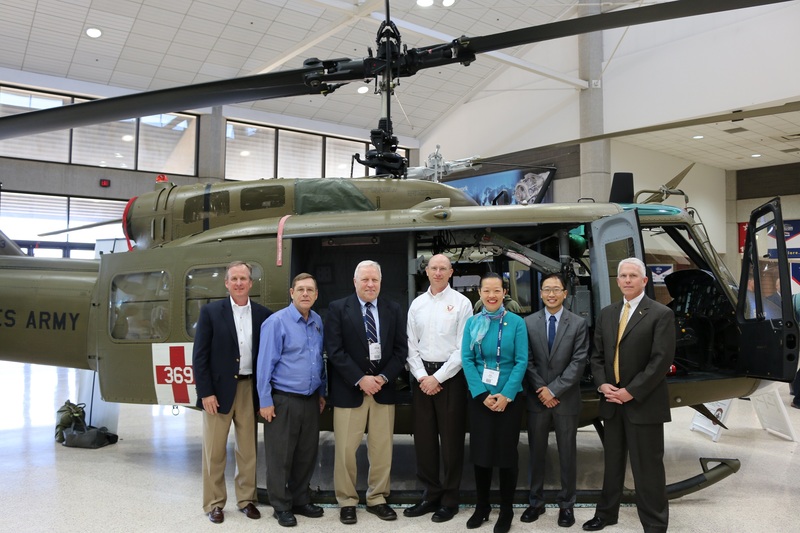 At the Safety Symposium prior to the official start of the conference, the Federal Aviation Administration (FAA) and members of the International Helicopter Safety Team/US Helicopter Safety Team (IHST/USHST) discussed crash rates and how safety affects the bottom line. While helicopter safety is not a standalone issue this year on NTSB’s “Most Wanted List” of transportation safety improvements, I reminded folks that helicopter safety is still a key component of many of our Most Wanted List issues, such as recorders, impairment, fatigue, distraction, and occupant protection. In 2015, the NTSB investigated 127 U.S.-registered helicopter accidents in the United States, and 18 of them were fatal (resulting in the deaths of 29 people). Nine of those fatalities came from helicopter air ambulance (HAA)/helicopter emergency medical services (HEMS). As we can all agree, any fatality is one too many. I am pleased that this “vision zero” is also the driving theme of the IHST/USHST, which announced a goal of working (for as long as it takes) to achieve zero helicopter accidents, with a particular focus on fatal accidents. The HAI is also advancing safety through its new safety accreditation program certifying safety programs from different types of helicopter operations and by working with academia under a grant from the Federal Aviation Administration (FAA) to develop a flight data monitoring program that assesses data from the industry to identify trends and make safety improvements. With all these efforts underway, the industry will take a giant leap toward improved safety. I am confident that helicopter safety will continue to get better and better, with the leadership of industry groups like HAI and the voluntary efforts of owner-operators to implement safety improvements, even before federal regulations have passed. Take, for example, the flight training school owner-operator I met from Colorado. In our Safety Symposium session, he talked about proactively implementing safety management systems and risk assessment programs, investing in high-quality scenario-based simulator training for pilots-in-training, and implementing flight data monitoring systems in all of his helicopters. He also changed the flight pattern to enable safer landings and takeoffs around his school. While this owner-operator focused on safety because it was the right thing to do, and despite expecting to lose money, he saw a financial return in many areas, such as insurance savings, earned media, employee retention, and student simulator rental. Perhaps, most importantly, he lowered the risk of accidents and injuries to his instructors, pilots-in-training, and passengers. It is inspiring to hear from hardworking business owners that safety improvements can – and should – be made, and that, in the end, such initiatives save both lives and money. The lifesaving improvements we talked about at Heli-Expo are all recommendations the NTSB has made over the years to the helicopter industry, most recently to public and HAA/HEMS-category helicopters. During the conference, we discussed the importance of recorder technology in improving safety. Over the last decade, the NTSB has made more than 30 recommendations to the FAA and industry requiring the installation of crash-resistant flight recorder systems on all newly manufactured helicopters not already equipped with a flight data recorder and a cockpit voice recorder. “Expand Use of Recorders to Enhance Transportation Safety” is on our 2016 Most Wanted List. Had recorders been installed in many of the tragic crashes we have seen in recent years, the industry might have had more information and data about how and why accidents happened. I was also proud to see the presentations given by our Aviation Safety team regarding another of our very important recommendations: requiring crashworthy fuel tanks in all newly manufactured helicopters – not just those designed before 1994, when the original standard was issued by the FAA. Those who survive accidents should not have to succumb to post-crash fires, a tragedy we have seen in our investigations, such as the HAA/EMS crash in Wichita Falls, Texas, in October 2014, and the July 2015 accident in Frisco, Colorado. Our NTSB aviation experts reminded the industry not to wait for regulators to issue a mandate but to aggressively work with equipment manufacturers to identify retrofits or improvements that could reduce the possibility of post-crash fires. We know this is not an inexpensive or easy change, but we also know that, in the end, it will save lives and prevent injuries. Additionally, one of our investigators presented two accident case studies that involved complete loss of engine power, which demonstrated the need for the pilot to enter an autorotation within 2 seconds. The NTSB has issued recommendations on the proper technique for performing autorotations, and we were pleased to hear that the FAA recently announced it has added an addendum to its Helicopter Flying Handbook (FAA-H-8083) that addresses our concerns. Vice Chairman with Louisville, KY, Mayor Greg Fischer (far left) and Kentucky Governor Matt Bevin (third from left) at expo. Before leaving Heli-Expo, I had the privilege of addressing the general membership of HAI, alongside the Governor of Kentucky and the Mayor of Louisville. I thanked helicopter operators for their efforts in implementing NTSB’s safety recommendations and I applauded their unique talents and their contribution to our communities, our nation, and our world. I also was honored to take a tour of the expo floor, where I was impressed by the extraordinary display of helicopter ingenuity and the commitment to continual improvement through new technologies and services offered. Helicopters make a positive difference in our world. I left the conference with even more admiration for the helicopter community’s passion for their work and their dedication to safety. I look forward to working with them to keep everyone who flies in rotorcraft – whether as a pilot or a passenger – safe and sound. Twenty years ago, Florida State Legislator, Representative Irving “Irv” Slosberg, lost his teenaged daughter, Dori, to a tragic car crash. Slosberg mourned and still mourns, in the particular manner known only to a parent who must bury a child. But he also began the Dori Saves Lives Foundation. Since Dori’s crash, Irv has worked tirelessly to find effective ways to save lives and prevent injuries on our roads. In the subsequent twenty years, he turned his family’s tragic loss into an ongoing effort to educate, legislate, and develop rigorous enforcement strategies that can make a difference. 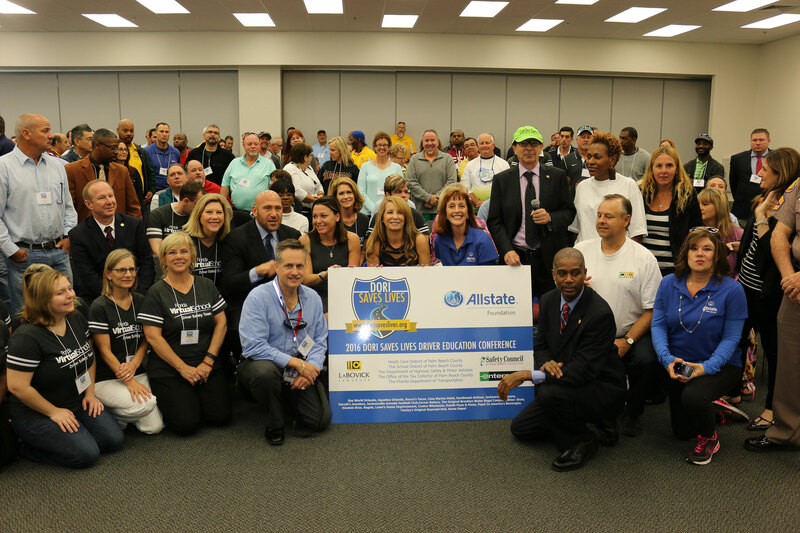 The Dori Saves Lives Foundation is collaborating across Florida to prevent people from driving distracted, fatigued, or impaired. Dori Saves Lives is working to advance the education of the most vulnerable drivers, our youth. The foundation provides tools to driver educators, the frontline leaders responsible for transferring knowledge, skills, and attitudes to our young drivers. 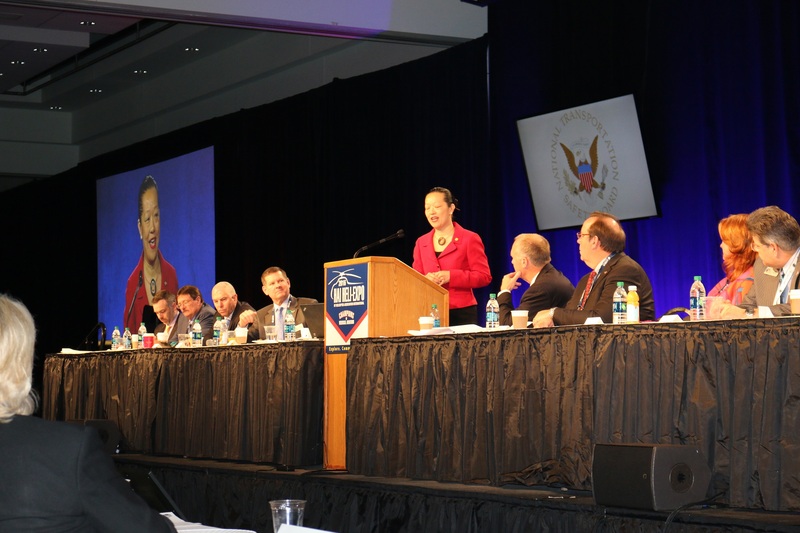 Last week, NTSB Medical Officer Nicholas Webster and I had the opportunity to address more than 200 driver educators at the annual Dori Saves Lives Driver Education Conference. Like the NTSB, Dori Saves Lives is working to End Substance Impairment in Transportation. Doctor Webster joined a panel of legislators, states’ attorneys, and law enforcement professionals to discuss the current and potential future dangers of drugged driving. 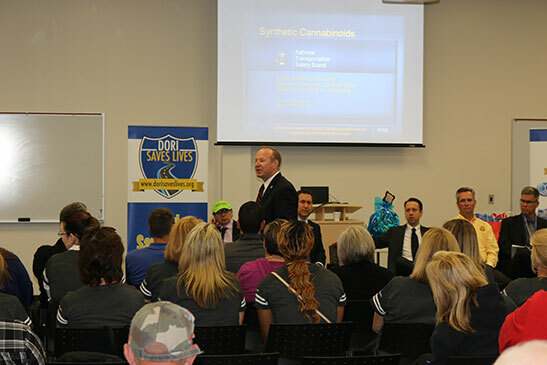 Dr. Webster went on to discuss the dangers that drivers impaired by synthetic cannabinoids pose to themselves and others on the road, pointing to the grim tragedy in Davis Oklahoma. Like OTC medicines, synthetic cannabinoids are often perfectly legal substances, and are not required to be tested for in commercial transportation. Dr. Webster’s presentation provided educators with an improved understanding of these and other safety topics to pass on to their students. The National Safety Council estimates an 8 percent increase in highway fatalities from 2014 to 2015, with substantial increases in some states – the largest year-over-year increase in nearly 50 years. South Carolina, Florida, and Georgia had increases in traffic fatalities ranging from 16 to 22 percent. This is a sharp uptick from a trend that had declined for many years and then leveled off. The NTSB continuously advocates for recommendations that will result in saving lives. But we can only recommend, make the facts widely known, and hope that others – from grass-roots organizations to state legislatures to manufacturers – continue the work needed to make our roads safer. With thousands of our young people already dying on the roads each year, the recent uptick in the trend is especially distressing. But Dori Saves Lives, and groups like it, are on the front lines of turning this distressing new trend around, particularly for our youngest, most vulnerable drivers. One important way to do so is to provide up-to-date information that driver educators can teach their students. I helped kick off the conference by reading some headlines about crash deaths among young people in Florida. Each of those headlines is the beginning of a story, and each of those stories is an incomplete sketch of a young person’s life – or death. Had Dori Slosberg lived, she might be raising young people of her own, and reading up on how to keep them safest when they get out on the road. But through the Dori Saves Lives Foundation, Irv Slosberg and many others are helping to prevent future tragedies among our youth. We want to thank Irv Slosberg for allowing us to share Dori’s memory. Like Irv, we think the best way to honor her life is to saves others’.